I always thought I knew what a danish pastry was, I was wrong. That dry raisin swirl covered in gloppy icing was all a lie!! 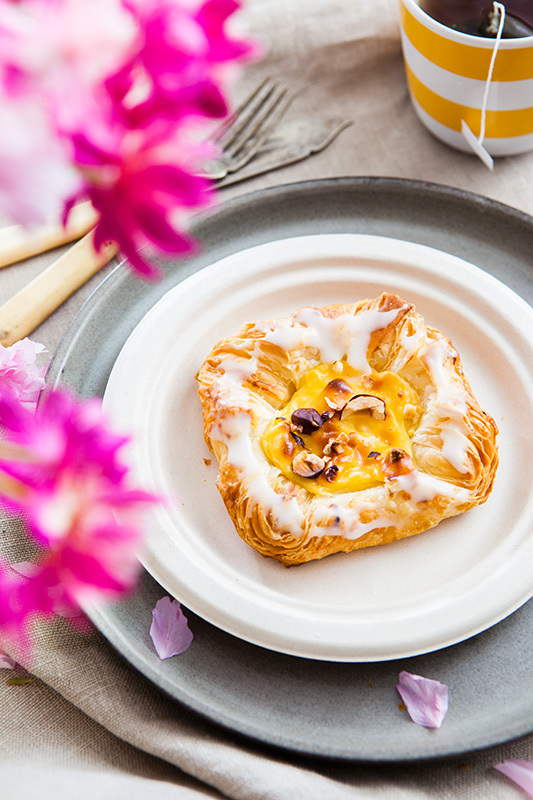 Funnily enough the Danes call their Danish pastry a Vienna pastry…. just to make things really confusing. Also the actual pastry itself is quite different where the filling is usually a custard/creme patisiere with a sprinkling of nuts on top. This is such a treat while in Copenhagen to just sit and have a coffee with one of these delicate crumbly pastries. Naturally I had to recreate it at home, alas without the beautiful city to accompany it. 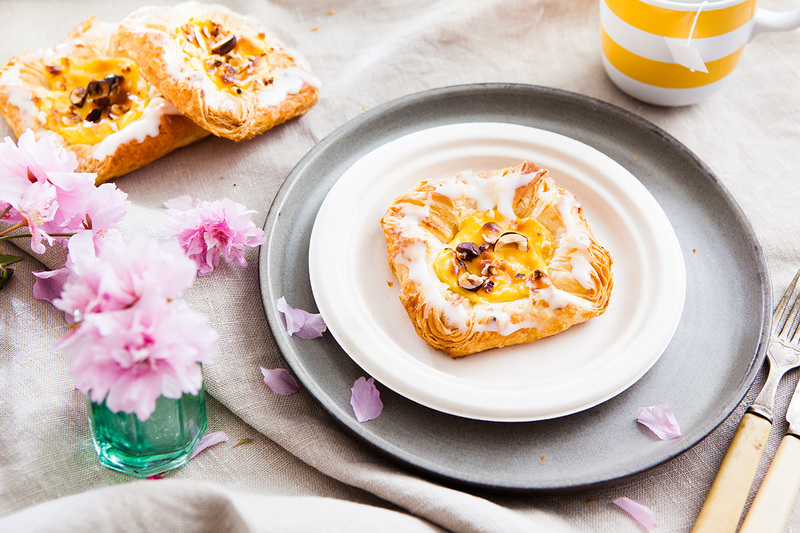 These can be made of course from scratch using your own puff pastry, but as all of our days can be quite hectic I used a cheats version and pulled some puff pastry from the freezer which made a fairly impressive coffee time treat for friends in really no time at all….Guilt? Not a bit. Return the mixture to a clean pot over a medium heat and whisk continuously. Make sure to scrape the sides and the bottom, otherwise it will burn. The cream will start to thicken and when you see the first bubble or two, take it off the heat. Pour into a shallow bowl and cover with cling film (pat the cling film so it sticks directly on to the cream) and refrigerate for at least an hour before using. Preheat the oven to 150°C or 300°F and line a baking tray with some baking paper. Roll out the pastry and cut into equal squares, you should get about 6. Bring each corner into the center and press down. Place a blob of the chilled crème pâtissière in the center of the square and sprinkle with some almonds or hazelnuts. With the egg wash, brush the corners of the pastry and pop into the oven for about 20mins until golden brown. Place on a wire rack and leave to cool. Add a couple of teaspoons to icing sugar and stir until you have a paste, with this paste, brush over pastry to add a bit more colour and sweetness. Looks truly delicious!! will be trying this one out.